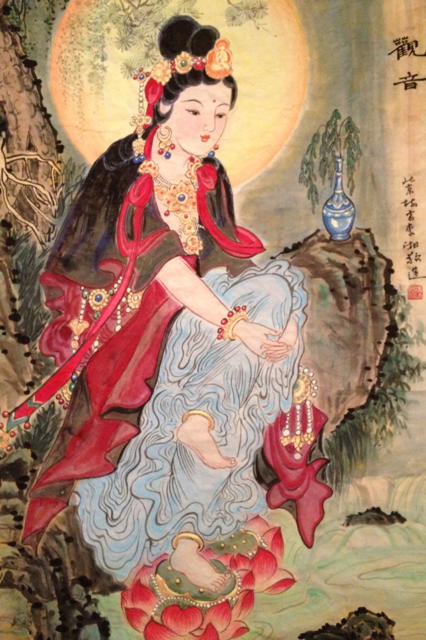 We have talked about “Guanyin” in various occasions on xiangliart.com. The work we are going to share with you today was completed by Xiang Li in 2012 for a beautiful home overlooking the gorgeous Public Garden in Boston, MA. Li has taken a Tang Dynasty approach by applying many vibrant colors when constructing this painting. Her client was extremely excited and pleased with the results. This painting was showcased during an art exhibition in Brookline, MA within the same year. Please share your comments and feedback – we’d like to hear from you on what YOU think!